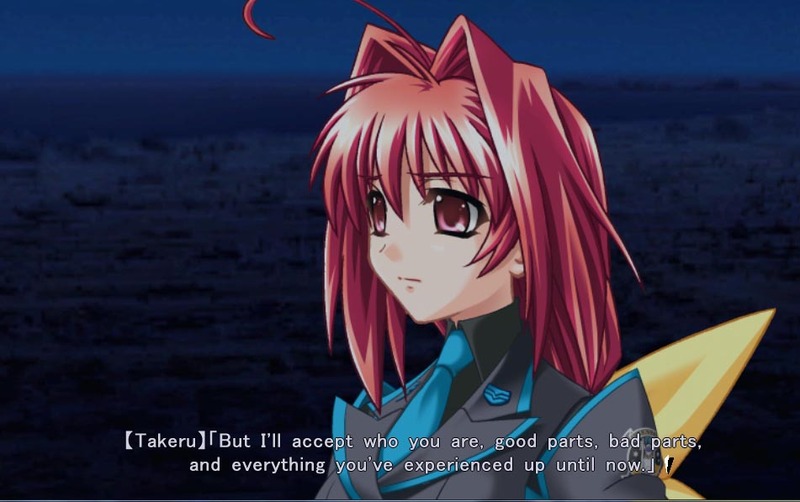 One thing that seems to divide the Muv-Luv fanbase to a large extent is the core reason why Takeru falls into the Alternative world and why he keeps looping through the Unlimited timeline until he begins to remember. Let’s open the issue a little bit here. Sumika was one of the people who were caught and experimented on by the BETA. She and Alternative’s original Takeru saw their townspeople taken away one by one as their screams echoed in the Yokohama Hive. She saw a Soldier-Class kill the man she loved soon after, and the next thing she knew was that her own sanity was stripped away just like her flesh. She became someone else, and locked her real self away as she became a mere lump of gray matter to be kept alive and observed by the BETA. What kept her alive was two things; love and hatred. I reiterate; the BETA ravaged Sumika’s world and home town, killed and raped her closest and most loved ones, then proceeded to slowly mutilate her body in ways she never could never foresee, and turned her very soul into a twisted mirror of all the darkest desires and fears all men have, then only to have flesh stripped from her still living body until she was reduced to her absolute minimum, where one can’t escape from. These beings from another world needed to be hurt and punished equally and then beyond. Understanding and compromise were not options, only the obliteration of the BETA would allow the souls of the dead rest in peace. The hatred Sumika felt wasn’t something a normal person would experience. While I personally believe in grays in extremes, Sumika’s hatred toward the BETA was nothing but pure, world cindering hatred. And all that stemmed from her loneliness and love toward Takeru. In her reduced state, Sumika’s mind had shut everything out she could, from her memories to her emotions. She barely thought a thing. Her unconscious repeated the only thing her heart truly desired; to see Takeru once more. With the retaking of the Yokohama Hive through the use of G-Bombs, something happened to her existence. It’s better to be left as an unknown event, but Sumika’s deepest desire crossed time and space with bittersweet consequences. She became cosmically aware on a very limited scale due to the G-Materials’ reactions to her unconscious wishes. I trust that most of my readers have enough life experience to say that love is not a clear cut emotion. It has shades of all the possible positives and negatives. Here, Sumika could only love in the most pure undistilled form combined with the wish to see Takeru again. Her wish to do it all over again before that destined day of 22nd of October, so that things could be better. Because of that one selfish wish filled with nothing but love, Takeru walked a path of The Day After time and time again. Sumika knows Takeru the best, but she is uncertain of herself and even less certain on Takeru. 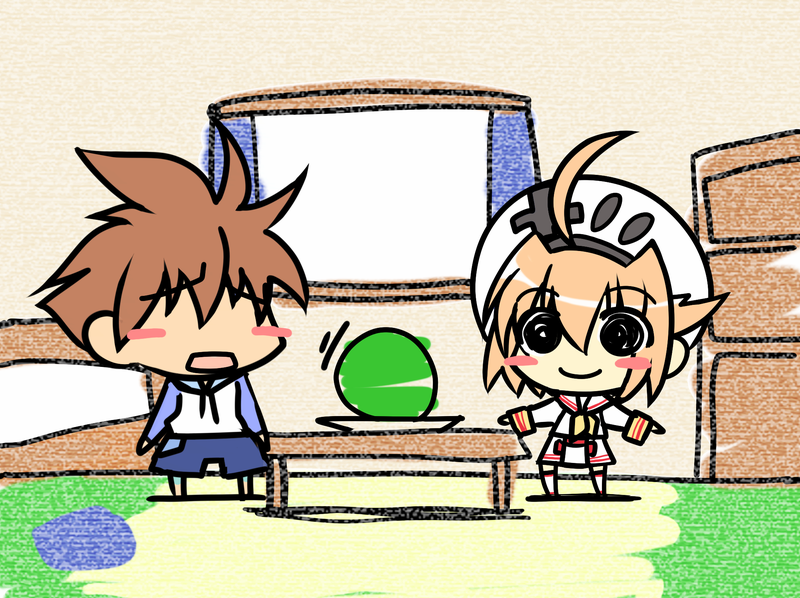 Her days with him in the Extraverse are happiness filled nonsense without a motion towards realization of her feelings and dreams until Meiya steps into the play. Yet she is certain of one thing; Takeru loves her sincerely, and despite the routes and everything involved, this is true. You can see his true emotions during Sumika’s and Meiya’s Extra route, and especially in Unlimited where he reminisces on Sumika and is happy that Sumika, as far as he knows it, does not exist the universe where the BETA exist. But Aalt, in Unlimited he automatically ends with Meiya or the other girls? How can he really root for ‘mika if he shags somebody else? Things change. Takeru was in an unknown world alone with versions of people he knew, and spend time with these people. He forged a new bond from his old ones. The time and place opened new doors for the others, where this one person was suddenly dropped into their lives. Takeru realized that he had to move on and live on what he had in his hands now, much like Takayuki did in the end of Kimi ga Nozomu Eien. Here’s a general rule for any romantic relationships; be in contact with physical presence. Sumika wasn’t there, and so he moved on. Life is harsh and in motion. Time does not wait. I agree that Sumika was selfish in her wish, but she can’t be held in full account for what happened to Takeru. We can play with straw man arguments as much as we want about Takeru suffering from Stockholm’s syndrome or whatnot as long as we are willing to see that ultimately nobody is to blame, much like in Kimi ga Nozomu Eien. Actually, how could he even suffer from Stockholm’s syndrome when he had no idea what kept him in Altverse? It’s also largely disrespectful against all the other routes and girls, as it would also imply that he ends up with each of them just because he is trying to find a way out rather than sincerely living his life as it is now. Even as Takeru is in Unlimited, he isn’t a weak person and accepts his fate to live in a world that isn’t his. The events that played out were not dependant on one or the other, and it wasn’t Sumika’s choice to go through the experience. I am positive that if Takeru was asked if he would go through Hell time and time again in order to Save in the Name of True Love, he would agree with a nervous Yes. In the end of Alternative, he barely is what he was in the beginning of each of the major chapters. He grows and adapts, changes and takes responsibility not only for his own actions, but for what he chooses not to do. He has a clear goal and responsibility of carrying all the consequences of his own desires. Yet, he is a normal teenager, fearful and self-doubting. Then, a miracle he never wishes to be true happened and Sumika, the 00-Unit, stood before him. 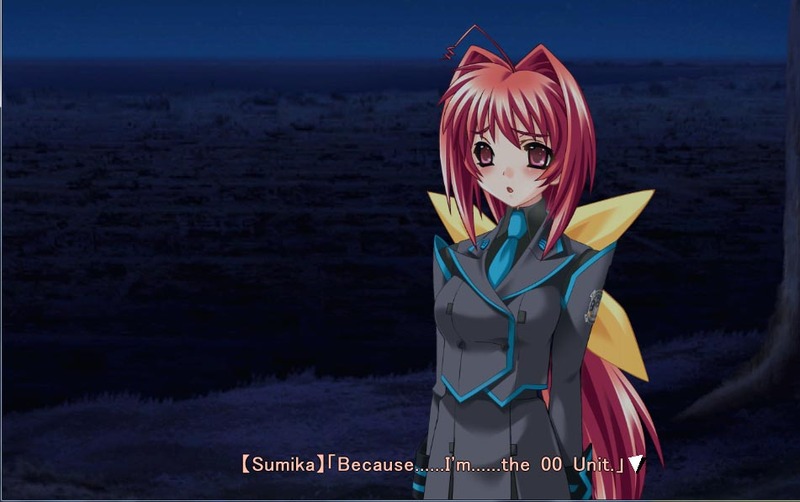 The 00-Unit arc, which can be seen as the True Route in Visual Novel terms, shows how Takeru has changed and how Sumika’s existence has an immense impact on him. No, even before that. Back in the Extra-Branch he saw Sumika’s accident and her losing all of her memories of him. He saw the one person he could always rely on to be there and the one he would always think of in the a [remove one article] place where neither of them ever wanted to be in. Sumika has always brought out the best in Takeru whenever necessary and that goes the other way around as well. What Takeru did for the 00-Unit was a selfish act from him. This is a complex issue, but I’ll put it like this; As long as there is a possibility to love and be with Sumika, Takeru will choose her. When she doesn’t exist, he lives a life without her because he has to. Sumika, as the person who has all the answers and keys both Takeru and Yuuko were looking for, is devastated as the 00-Unit. Her wish may have been the one that brought Takeru back to her and had him go through living hell again and again, but I dare anyone to say that if Takeru had known he hadn’t gone through all that. Ultimately, she tried to take responsibility on what had transpired and make sure that Takeru would not go through any more suffering. Much like too many people, she didn’t confront Takeru face to face with the issues. What she did was something we all have done to someone else. Something we all are most likely going to repeat in the future. But Sumika’s a person with little life experience, and she went through her own hell as well. Normally I wouldn’t give anyone or any character a break, but seeing that Sumika wasn’t all that healthy, I’m willing to let it go. Fortunately, the Takeru she knew wasn’t alive anymore, as the one in front of her had grown, and this Takeru decided to do something he should have done a long time ago. Take Sumika and give all of him to her in return in both body and spirit. The reason I love Muv-Luv are the main characters. I admit that I don’t give cents about the sides stories and I find The Day After rather pretentious with how its presented. No, that’s not it. I’m just mad at myself about a lot of things. Far too many things. What Sumika did was because she was scared. She pushed someone she loved from the bottom of her heart away because she thought it was for the best, because she was afraid how Takeru would see her after what had been done to her and what she now was. I assure you, dear reader, that without Takeru forcing himself through her defenses, the end result of Operation Ouka would have been very different and not for the better. In the end, what she did was not directly her own direct choice, Sumika did try to carry the weight of her deed, and she did it with the help from Takeru. 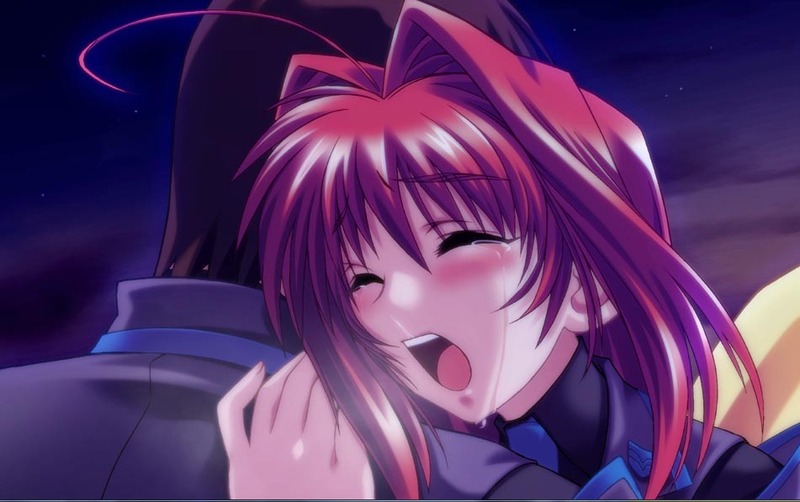 The thing I’m trying to say in a very convoluted way is that love in Muv-Luv, and in Kimi ga Nozomu Eien as well, is portrayed as a rather raw emotion. It is not fantastical, unrequited or fairy tail pure. You know what? I’ll take a break from the characters and I’ll write about the TSFs in the next Muv-Luv entry before Total Eclipse. It’s been some time since posted anything like this. I really don’t wish to deviate from the core of this blog too much, but sometimes it’s good to have a change. So, for today let’s eat a strawberry cake. Why is an annoying character like Kagami Sumika my favourite, I was once asked. The simple answer was, and still is, that I love her. She is sincere, her intentions are ultimately driven by love and… ultimately she is there, always. That is what I love about her. She may not be the most complex character, the one with most spectrum to her actions or even the brightest of the bunch. She is who she is, and despite her flaws, I still like her the most. Hell, I bought the 360 Double pack just to get Sumika’s Figma and I’d do it again goddammit. That said, I woke up last night and wondered why I was so awake. Then I just sort of remembered what day it was. That, and I found that I was hungry as hell, which made my stomach growl. Now, almost ten hours later from my initial writing, I actually have made that strawberry cake. So let’s sit down and remember all the good things we have had with friends and loves ones. I’ve been a bit busy, and I was intending to make up a bigger post to go with this, but due to unseen matters I forgot this altogether. I’ll make that post later this week as well as few other loose things that I’ve been meaning to dig into. But meanwhile let’s just eat this piece of cake. 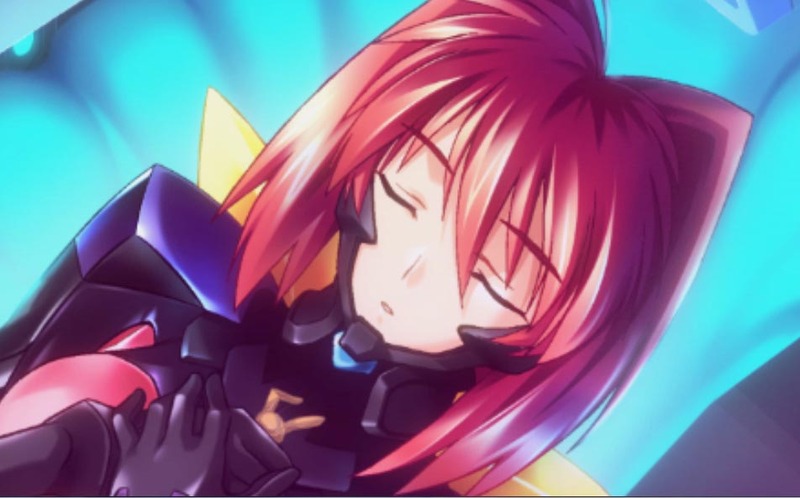 With this post again I’ll stick my head into something out of my league and talk about MuvLuv again in a very personal manner. However, behind that charade I’m trying to observe how would a person act after losing all of his sensory inputs for a time with the visual novel’s context. 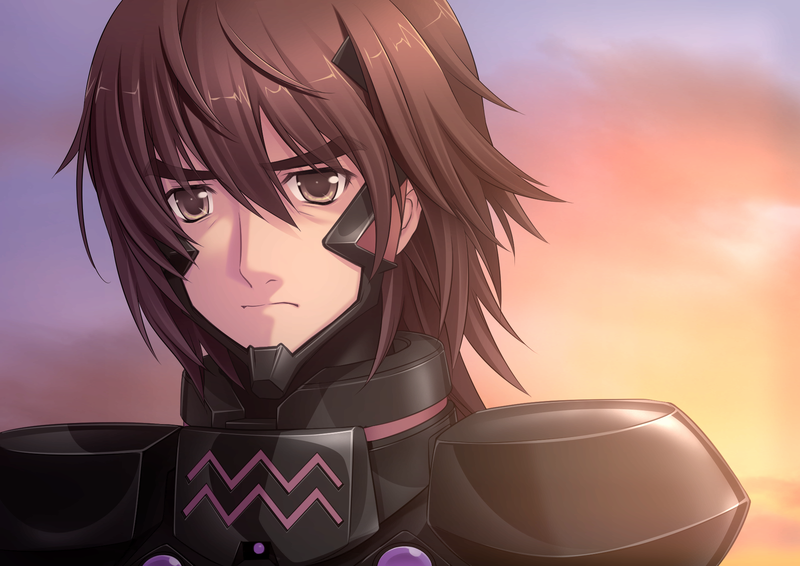 As always with MuvLuv posts, anything below this point is heavy on spoilers. If you haven’t yet read the visual novels, you might want to skip this post altogether again. 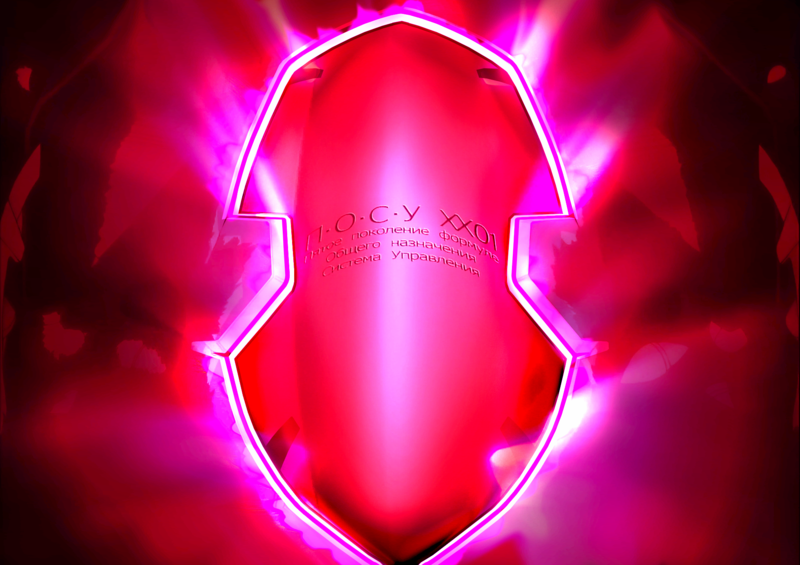 In MuvLuv Alternative âge pulls one of their finest punches without holding back; the 00 Unit. Up to this point the readers have not seen or met this worlds of Kagami Sumika, as it was told that she didn’t exist in this world. However, there she was, standing in front of me, almost catatonic, barely acknowledging anything around her, eyes clouded and lifeless. The 00 Unit as she’s known goes into a fit of rage, repeating the same words over and over again. I was heartbroken. She had become the one I loved the most of them, and now there she was. Here, in a world almost literally torn apart by war against an enemy barely understood. She didn’t even acknowledge anything else around her, except her own will to kill, and the constant headaches. Rushing in to hold her, she denies my existence and becomes completely panicked. She tires herself out fast, and becomes limp in my arms, sleeping. She denies almost everything that’s around her. She doesn’t acknowledge either me or herself. She is barely alive. What drove Sumika into this state was no more than total physical and mental abuse, fate worse than death, which she choose to enact by holding to one wish that kept her alive. 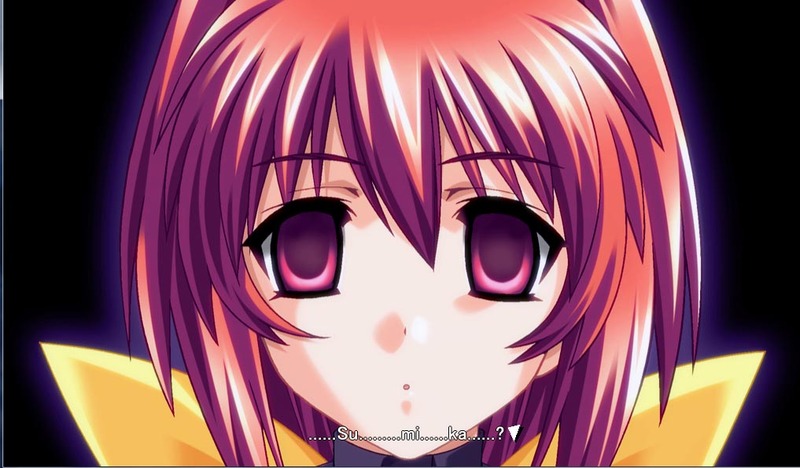 Prior to the events that takes place in MuvLuv Alternative the hometown of our main characters was under BETA attack. Some of the populace was taken captured and taken to the BETA hive rather than outright killed. The reason was to study humans, and how BETA studied humans was less than comfortable. Takeru and Sumika were there among others. They were the last two from the others, and even then Takeru tried to protect Sumika the most he could. She saw him die, and held his dead body in her hands, feeling as he got colder and colder. At this point her mind became blank, or it would’ve become if the BETA hadn’t started experimenting on her. The BETA began to stimulate her body, finding every bit that made her feel good, and never stopped. She hated them for it, violating her body over and over again without a pause. She hated herself for allowing them to do it to her, and that she became to enjoy it, as the BETA covered her in their own extracts and manipulated her bodily shapes into new forms. At some time, it wasn’t enough for her, and the BETA started slowly to get rid of the extra bits in the pleasure’s way, ripping her apart piece by piece until nothing less than her very core, her brain, remained. This is covered by Sumika herself to me, told with a psychic link to let me see and feel everything. After witnessing what had happened to her, I couldn’t let go. I never could have. I’ve wondered what kind of experience it must’ve been for her. Sumika experienced large amounts of horrifying shocks, which only lead her whole sensory system overloaded with information only to be dumped into a glowing tube where she could not feel, see or hear. To her there was nothing else than she. The world outside could not be perceived. She must’ve been completely out of her mind for a time, seeing and hearing as her brains tried to cope with sensory deprivation. She wasn’t alone in this condition, and what the in-universe evidence shows, all of them basically shut down. Died. In her very mind there was two things that kept her alive; her strong will to kill every single BETA, and more importantly, the strong subconscious wish to see Takeru once more. Imagine yourself being torn apart, losing limb after limb. Then one by one your eyes are plucked out, followed by your hearing, your voice and everything else, until you’re in complete blackness forever. No matter how hard you try, you just can’t. To be with nothing less than your own thoughts must be like a purgatory at first, especially if you’ve been treated like Sumika was. Do you feel phantom pains? Do you still hear and see things outside hallucinations? At one point the brains just die out, or rather become a vegetable. It’s a complete psychological and physiological shock to the system. Would it be possible to cling to one small thought that would keep your core alive? To create the 00 Unit, Kagami Sumika had to die. A literal death and rebirth. To create an exact copy of the person she once was, to quantify her personality and memories, that which is the last remains of human has to die. 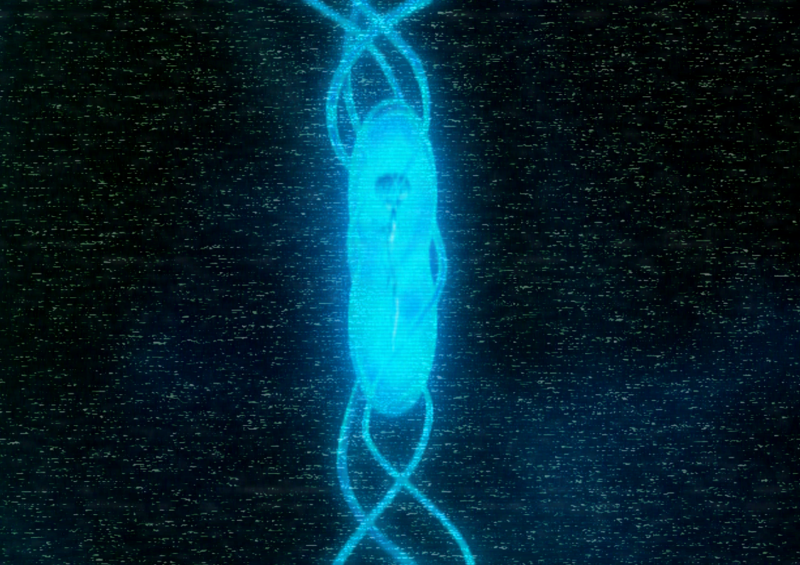 The quantum computer now serves as her core, her brain and the place where her soul resides. Her body is artificial and mimic human functions. She could live completely normal life with small additions like ESP and higher strength, but she never could have children. Knowing Sumika, this is rather big deal, even in a world where there is only one shining glimpse of hope. To me from the very second I knew what 00 Unit was it ceased to exist. 00 Unit was Kagami Sumika, and not just another machine. True, her body and everything in it was artificial, but one can’t deny the very human that she was inside. If I were to die and my essence was transplanted into a HDD that would serve as the brains for a robot, that robot would essentially be me. Physically perhaps completely different, but in mind nothing less than me. I wonder what kind shock it have had to be to Sumika’s mind, to the soul, to see and hear again, or to move an arm. She must’ve been thinking that she was hallucinating again, denying that she was alive. How does a mind act, when everything in your body tells you that you’re alive and well, but you know that’s not true? Your brains functions completely, feeding you all the information a normal body would receive and more, but the mind simply won’t accept it. In what stage she became aware of her state, that she was artificial? It’s a crucial point, as admitting that she is artificial allows to take another step towards proper functions and accept her new body. The second stage would be not to allow this to define her to a large extent. However, in the situation she was in she had no choice; she was reborn for one purpose only, and that purpose she had every intent to fulfil; the complete eradication of the BETA. Her portrayal is childlike with one way of thinking. Only with the one person she wishes to see the most she takes baby steps towards her true personality. From almost insane rages and catatonic sleep, to catatonic playing with string as her mind copes with new sensory inputs and that she is whole again, to simple promise “I won’t go away again. I’ll be here for you.” The last point is where we can say that she starts to open her shell bit by bit, allowing her to remember and know, as well as acknowledge what she truly is. Sumika’s growth is fast. Slowly she talks more, but still in simple words. She speaks of vengeance, goes to wake her precious in the morning and messes her memories with that of Kasumi’s. She slowly grows with every experience, and with every honest smile she has to grinch in her subconscious. She grows into a young girl. Not really a child any more, accepting her surroundings more and using her new powers granted by her quantum brains in childish ways. She realizes. The one she loves is the one she has hurt the most without realizing it. The only thing she can do to amend her misdeed is keep him away, to make sure that he will be safe. He shouldn’t do anything more than he already has. Even if it takes her own happiness to keep him safe in this world. Even if she has to make him hate her. Because what she is. The amount of both physical and mental pain she has gone through must’ve been… insane. Unmeasureable. She lies, she arranges Takeru’s transfer to another unit, she keeps keeping him away. She does things out of love and good intentions. Wrong things, but everything is for him, and his survival. As Sumika leaves broken Takeru standing on that hill, she breaks down in tears and sadness. With Meiya’s help, Takeru forces a meeting with Sumika once more and… she shows him everything she’s gone through. At this point she is fully aware who and what she is, but she hasn’t accepted some things. Not until that one accept her. Everything that she is, giving himself completely to her. Sumika’s own walls start to break down, and she accepts both her emotions and feelings. She is accepted who she is. It doesn’t matter what she is. It never has. That night she becomes human once more. No longer she allows her status as the 00 Unit define her completely. She has accepted that she may become happy once more, and be with Takeru. Until the world turns upside down and all hope is lost but one shining glimpse. Those individuals who carry the weight of the world on their shoulders match towards the Hell’s nest. Much like those before her, Sumika decides to walk the road that leads to love and death. During all this time she just wanted to see Takeru, and now… she’s letting go. What she has done with or without her own conscious acts are all ending at this point; she allows herself to be the tool, the 00-Unit, for Takeru to become the saviour. 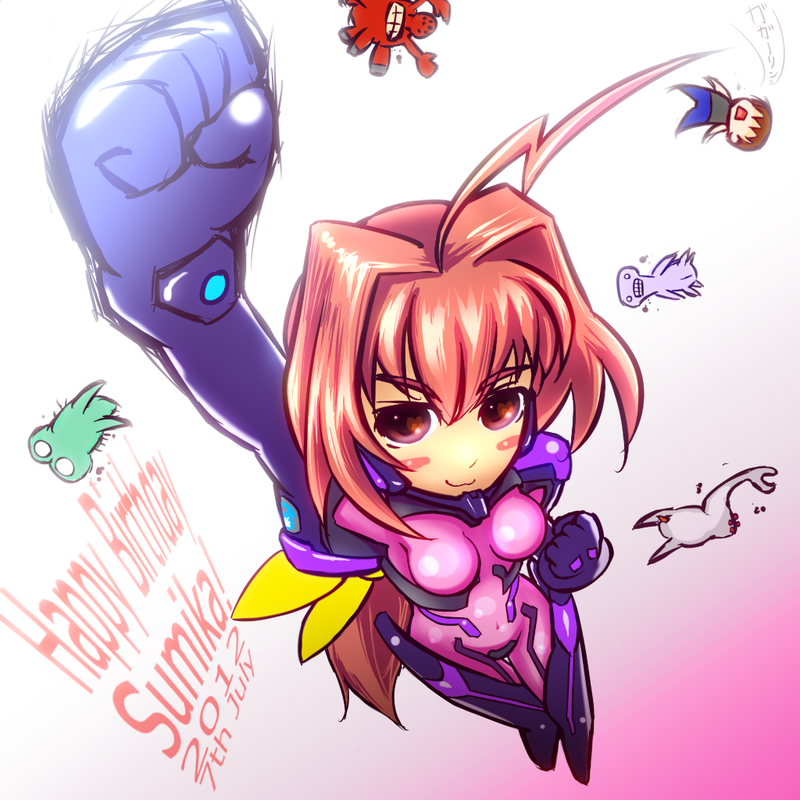 Sumika as a person is the strongest character in MuvLuv. Her love is what carries her spirit and deeds, and this is her driving force. Her love towards Takeru is also her weakness, and she is somewhat dependant on Takeru just as Takeru is dependant on Sumika. Their friendship has been there a long time, at least since early childhood. How long they’ve loved each other is an open question, and it took something completely out of this world to Takeru to realize his feelings. If I were to give a comparison to Sumika, it would be Suzumiya Haruka from Kimi ga Nozomu Eien. They both are characters that seem rather soft and easy to hurt characters (Sumika much less) but then they step out from a traumatic experience (Sumika had far more hurtful experience thou) only to do what is necessary to do; to do what their love required them to do. In a way, they both let their love go, for his own happiness. Be it at the expense of their own happiness, or something more. 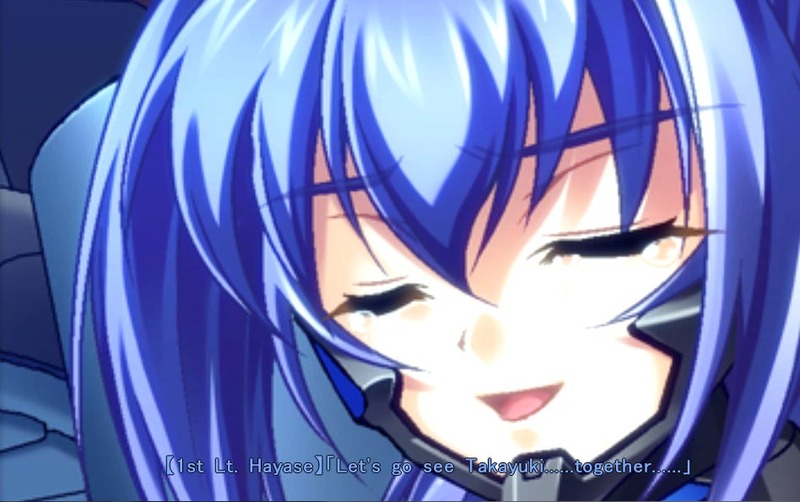 Naturally, Haruka had her own route in Kimi ga Nozomu Eien, but even âge seems to agree that Hayase end is the more canon one. 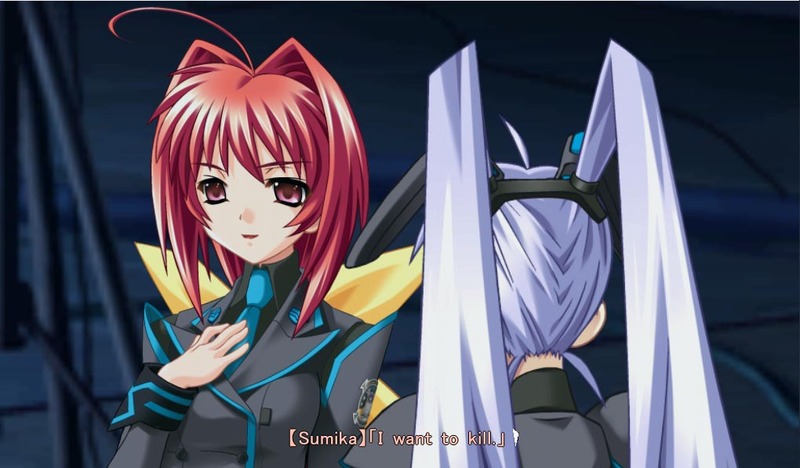 When discussing Sumika’s part in MuvLuv we need to take account her state. I haven’t seen this kind of situation in any other thus far. The closest thing is when human brains are installed into a robotic body, but Sumika’s case is different; it’s the mind that is installed into an artificial body. I’ve tried to find psychological papers on what kind of things a mind goes through when it’s not in its body any more, but I guess it’s impossible to study such thing at the moment. Psychologically Sumika goes through fear, loss, hatred, brainwash, extreme pleasure and pain through by ripped physically into smaller pieces, then shut into her own world without any stimuli from outside world, alone with her grief, loneliness and hatred. A normal mind would die, but Sumika kept herself alive. She fought to keep herself alive, even thou brains shut down if they don’t get any stimuli after certain period of time. She fought, she survived. Sumika fought, she survived, she met the man she love once more, and embraced the world for the last time, as a human and nothing less.